Lydia Apatiki (Sivuqaghhmii) is a traditional St. Lawrence Island skin sewer who uses materials harvested and gathered by her family to create intricate traditional Yup’ik dolls, game kick balls, and bird skin parkas. She is a speaker of St. Lawrence Island Yup’ik and taught the bilingual program for many years at the Gambell school, where she developed a language workbook for elementary grades. In 2015, Lydia was recognized by Senator Donald Olson for preserving culture and ways of life on the St. Lawrence Island. Thousands of birds flocked overhead, but the wind blew the wrong direction, and the men did not catch a single bird. Weather, location, timing. These are traditional harvesting practices Lydia’s bird catching husband, Jerome (Sivuqaghhmii) wants to document. He is her helper and partner in the curriculum she is working to develop on sewing traditional bird skin parkas. 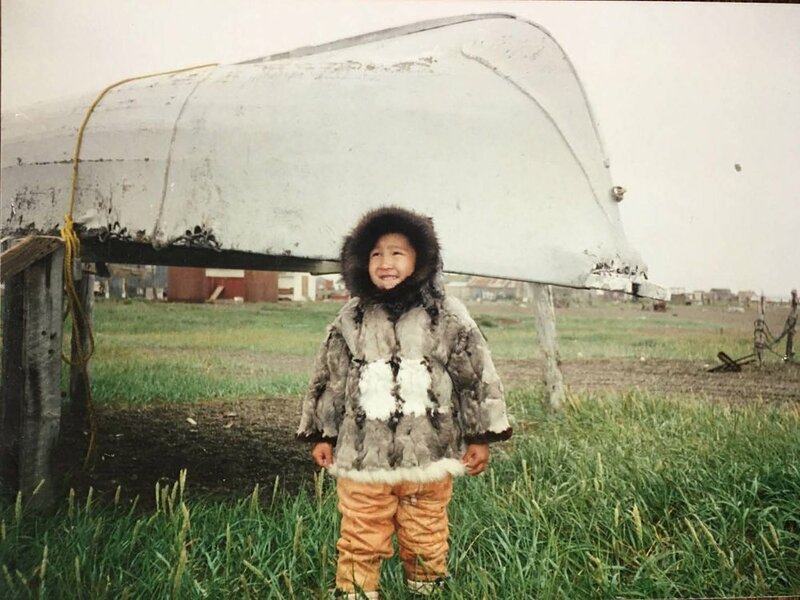 When Lydia committed to making her first bird skin parka a decade ago, her aunt and stern mentor gave her no opportunity to fail, even when she wanted to give up on that most challenging project of her life. “You start your parka, and I want to see you finish it completely,” Aunt Adeline said. Lydia kept going, learning traditional stitching and eventually, she finished the parka. Lydia travels to the mainland, to events such as the elder’s conference in Nome, to seek knowledge of traditional stitches, of who can teach her more correct practices than she knows. When Lydia finds material, she adds it to her new computer, slowly collecting information she needs to create a sewing curriculum with the help of the Kawerak, Inc. staff and Northwest Campus staff. Her First Peoples Fund Cultural Capital fellowship supports the process as she gathers knowledge, much like her people still gather berries and roseroot for the winter. “It broke my heart when a young lady wanted to learn how to make a bird skin parka but had no one to teach her,” Lydia said. She wants this curriculum to educate youth in these practices.